A lot of facilities mainly for tourism, but also for industrial, agricultural and military purposes… are left abandoned in European mountains. These installations which are no longer in use, often injure the landscape as genuine scars. As they are obsolete they should disappear. Heaps of old iron or concrete, pylons and cable lifts, old facilities near shelters, small buildings for various purposes … they materialize the disengagement of the actors at the end of the life cycle of their business operation. It’s not only a visual visual pollution, it’s also a real danger to hikers and to wildlife. From 2001, Mountain Wilderness organizes each year cleaning operations in various European and remote mountain ranges (Ecrins, Mercantour, Elbruz, K2, Huayshash …), demonstrating that it is possible to restore the mountain’s natural state. The Mountain Wilderness activities is structured around 3 topics: inventory, dismantling and awareness. Col du Mont Lachat: The buildings of the military wind blower should be dismantled and the site restored to its natural state. Work should start during the 2015 summer. A large mass of concrete will be destroyed and evacuated. The operation is controlled by the municipality of Saint Gervais, with the participation of WWF and Mountain Wilderness. Cosmiques Pylon: it was the arrival of the third section of the Glacier cable car going to the summit of the Aiguille du Midi, (Glacier station-Col du Midi section). This is a very unsightly scrapy and bulky set-up, a wart in this beautiful site that still supports the electricity line powering the Aiguille du Midi station. His removal is being discussed. 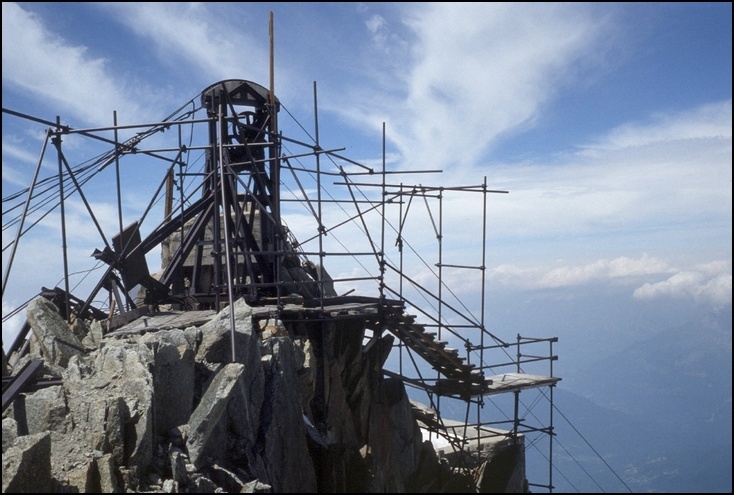 The choice of the project leader has to be finalized among the four involved partners: Mont-Blanc Company (the owner of the Aiguille du Midi installations), Chamonix Guides Company, Chamonix Municipality, Mountain Wilderness. 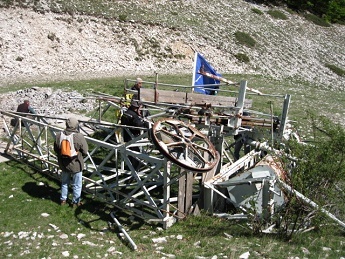 Flégère service trolley: it was dismantled in spring 2015 by the Mont-Blanc Company and was unused for years and while tampering the golf site. E.D.F. Argentiere glacier cable way: its removal is on the agenda. Argentiere F.I.S. Chairlift and former Pélerin and Bossons lifts: they were dismantled and removed entirely by the municipality of Chamonix (a few concrete blocks are left in Argentiere). Cable car Glacier: the old line currently supports the high voltage line of the Aiguille du Midi. Several towers are unnecessary and should be removed. However the Para and Glacier stations, built with carved granite, as well as the old cars, are part of our heritage. A great cleansing is however needed. Line owner: Mont-Blanc Company. Mer de glace (Sea of ice): it is the black spot. Every year, tons of trash, including many cables, released by the glacier, are collected and disposed of by the local associations. All of these waste come from the altitude installations of the Aiguille du Midi and Helbronner, which have been abandoned by operators during the years 1950-1980 and were quickly covered by snow. The existing ski areas of the valley are considered to be in a satisfactory state of maintenability. After remodeling the area landscape the Emosson company plans to clean several obsolete facilities. Hikers in the region are invited to report to Mountain Wilderness on missing obsolete facilities.